As Abby’s business has grown over the years, the former teacher has also become somewhat of an activist for the craft and sewing industry. Along with a few other bloggers, she has advocated for issues that many others don’t talk about such as workshop instructor pay, blogger compensation, perplexing policies/practices of industry organizations, and the plight of local quilt/yarn shops. Oh yeah, she also has a podcast, and along with Kristin Link of Sew Mama Sew, she started the Craft Industry Alliance – a trade industry for makers, designers, suppliers & bloggers. Pretty busy lady, right? Wait… did I forget to mention that she also has three young daughters? 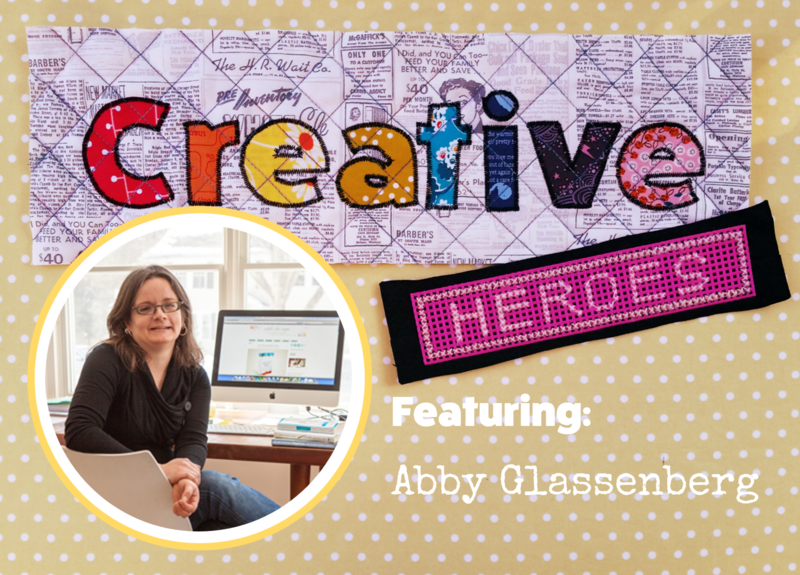 When I conceived of the Creative Heroes series, Abby was actually one of the first people I put on my list to reach out to. She is simply a fantastic role model in efficiency for creative business owners. My initial thought after reading Abby’s blog posts explaining how she structures her day was one of amazement. How she gets so much done in short windows of time… pretty much the bulk of her work gets done while her kids are in school! She asked me if I ever pulled an all-nighter in college. I have to be honest, I did a couple of times. But she actually never did! She told me that she made a point never to miss class, she took good notes, did her reading and writing assignments without fail, and always went to bed on time. “I’m really not a procrastinator,” she explained. I wondered if her family cultivating those tendencies in her while she was growing up? Or did she attribute it 100% to her wiring? Abby explained that her mom was a writer who freelanced until Abby was in high school when she took on a more traditional journalism job. Her dad is a lawyer who had his own practice. He also did some other entrepreurial things, such as starting a community credit union. She went on to say that her dad had grown up poor and she saw both of her parents working really hard to be successful. That had a great impact on her. Nothing was all that structured in her childhood home, but she was encouraged to explore her interests and get involved in things. Her brother, on the other hand, has ADHD so things were different for him. He’s a successful lawyer now – he took over their dad’s practice – but he struggled growing up in ways that Abby feels she did not. I wondered if her individual outlook was something she developed over time or if she thought it was something that we are born with? “I’ve always been a really fastidious person,” Abby said. I know exactly what she means but do I think a lot of people have a hard time getting themselves in that head space. I related to her that I think people can be very self-defeating. They often set themselves up for failure. Even people who wouldn’t call themselves perfectionists, find themselves giving up before they’ve even started because they imagine it won’t be perfect. I agree with Abby’s observation and have often challenged students of my Time Management class in a similar vein. I’ve asked crafters why – when craft show schedules/applications are put out months in advance – are they procrastinating and scrambling and making excuses in the 11th hour before a show. I also think that awful need for perfection sometimes comes from comparing ourselves… That whole comparing-your-inner-world-to-someone-else’s-outer-world thing. I mentioned this to Abby and said that it’s almost a relief to me when I talk with someone who has “made it” and they say that they still have those moments where they are scared that they aren’t enough. As Abby and I chatted further, I mentioned that I was curious about her summer schedule versus her school year schedule. In my case, my son is in college now so structured summer kid stuff isn’t an issue and I think my seasons kind of blend into each other without much change. But since so much of Abby’s work gets done when her girls are at school, what does she do in the summer? As we discussed the topic of juggling a business plus our kids’ needs, I was reminded of Megan Neilson’s recent article about running a business with three small children at home. I personally love the idea of getting kids to experience “alone time” and to explore their own interests so, as moms, we can have time for our own work. “…We just finished re-reading the Little House on the Prairie series with my youngest one and you know, Laura’s mom does not come out onto the prairie and play with them… Laura’s mom is not playing ring-around-the-rosy and hide & seek in the yard… Laura’s mom is making soap. And cleaning. And cooking. And cutting wood. And doing all that important work. I mentioned that I think it is a terrible fallacy that working moms are made to feel that they be able to give 110% to their families AND 110% to their work. Perfect balance is just a myth. I told Abby that’s definitely something I address when I’m teaching creative people about time management. We have to choose what’s right for our families, but also balance our own needs and professional development. I always give the example that I was never a PTA mom. I sent money and supported the school where I could but I usually had to bow out of the PTA stuff when my son was little. As our conversation progressed, I mentioned to Abby that I’m not sure I’ve ever heard her talk about the actual methods she uses to keep track of her business schedule. I asked: Can you talk about calendars? Or whatever kind of technology you use? Abby said that she uses iCal. She has a Mac laptop, both she and her husband have iPhones, and they have a desktop Mac computer for the kids. So iCal can sync across all of those. She explained that they have different colors to denote different things – one color for family stuff, one color for While She Naps business activities, and another for Creative Industry Alliance things. She went on to say that she and Kristin also maintain some Google docs for other Creative Industry Alliance scheduling needs. And of course, she has her yellow legal pads for her To-Do lists. I had to laugh. I remember reading about Abby’s legal pads! It’s something that I love about her. I mentioned to her that I’m pretty proficient managing things with technology, but I really like to physically write things down as well. To wrap up our talk, I asked Abby if she had any advice for Creative + Mindful readers who struggle with disorganization/productivity and are trying to bring structure and organization to their creative lives, or creative businesses? I related that pretty much all of the people I’ve talked to for Creative Heroes have said lists are really important to their work and breaking things down is critical. Enormous thanks to Abby for taking time out to chat with me about productivity and kid-schedules and old school note taking! Want more Abby? If you’re looking for business and industry suggestions, be sure to check out her website. (And sign up for her weekly newsletter – it is one of just a few that I religiously read in its entirety every week.) You can shop for her patterns, ebooks, and other goodies there too! Also, if you are an arts & crafts business owner – or thinking about becoming one – be sure to check out Craft Industry Alliance membership. It’s a great investment for your business!